News Archives - Superior Tank Co., Inc.
We are proud to announce our first bolted steel tank powder coated in Texas has shipped! Our brand new powder coating line located in our Texas Operation Center began coating our bolted steel tanks recently and we anticipate the new facility will make a significant difference. “b. For Type 6 tanks, the overturning ratio, J, as determined using AWWA D103, Eq. (14-32) shall not exceed 0.785.” This new verbiage has significance to bolted tank design as it impacts where a bolted tank with a Type 6 foundation can be used. A Type 6 bolted steel tank utilizes a steel base ring shell embedded into the concrete foundation which also serves as the tank bottom. The J ratio relates to the seismic loading and is a criteria used to determine if the storage tank requires anchorage. A value of less than 0.785 indicates the tank wall will not experience uplift and does not need anchorage. Conversely, a J ratio greater than 1.54 requires the bolted tank to be mechanically anchored. Ratios between the two values may or may not require mechanical anchorage depending on other factors. Essentially, the ASCE is requiring embedded shell bolted steel tanks not to be used in areas where uplift occurs due to seismic activity. The concern is there are no specific design requirements for the anchorage of the shell to foundation and the concrete bottom included in the AWWA D103 therefore it is difficult to ensure ductility of the tank to foundation connection. There is a risk of the shell separating from concrete tank bottom during a seismic event as a design criteria does not exist to ensure the connection is properly designed. ASCE 7-16 does not restrict bolted tanks with other foundation types; only tanks with an embedded shell. 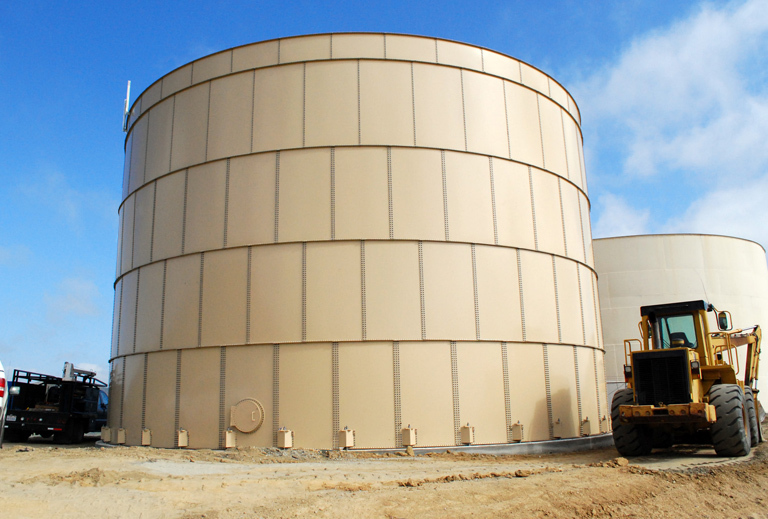 For most applications, Superior Tank Co., Inc. will design our bolted tanks to use foundation types 1 through 5. With foundation types 1 through 5, the storage tank will include a steel bottom which structurally ties into the bolted tank shell creating one uniform structure. 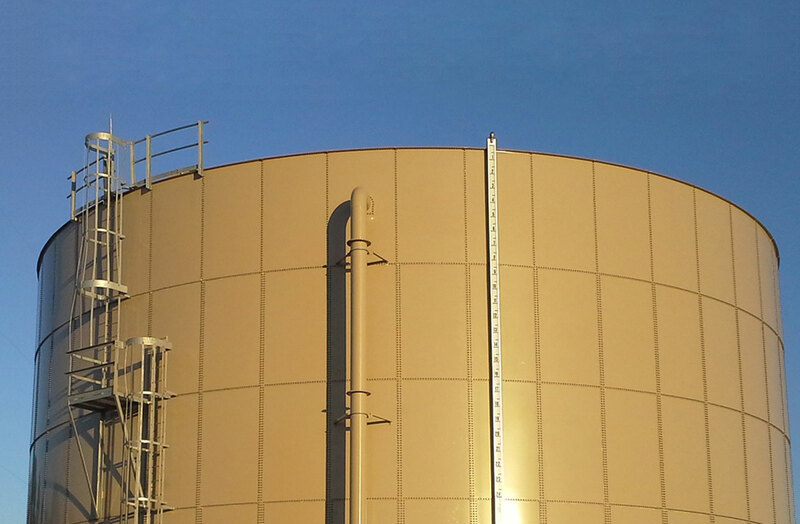 This new terminology is another example of how bolted tank standards are continuously evolving resulting in more resilient bolted steel tanks. Superior Tank Company is proud to announce we have recently earned NSF International Certification for our bolted steel tanks over 14,309 gallons. NSF/ANSI 61 and 372 Certification of our bolted tanks demonstrates compliance to the internationally recognized health effects standard for drinking water system components. NSF International led the development of the American National Standards for all materials and products coming into contact with drinking water and NSF/ANSI 61 & 372 sets health effects criteria for many water system products, components and materials. For example, NSF International standards are used to verify the safety and performance of water treatment and plumbing components and to ensure these products do not leach harmful levels of contaminants into drinking water. How Much Does A Bolted Steel Tank Cost? One of the first questions we are asked is “how much does a bolted steel tank cost”? Unfortunately, the answer is a little complex as the price of a bolted tank is impacted by a variety of factors. 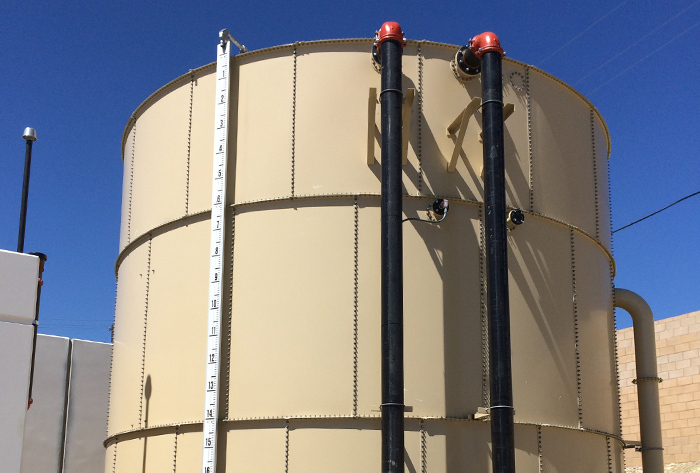 Elements include storage tank design specification, relevant local building codes, quality of raw materials, scope of work included in the contract, manufacturer experience and tank installation team skills/training. 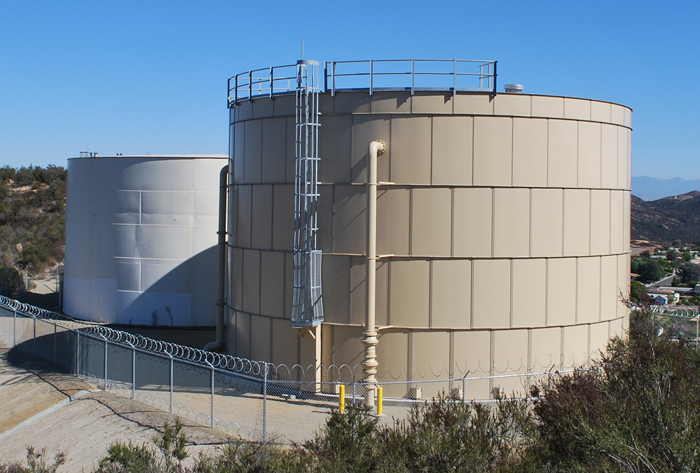 The various design specifications such as AWWA D103, NFPA 22 and API 12B determine tank appurtenances, shell design, steel thickness and even tank size in some cases. 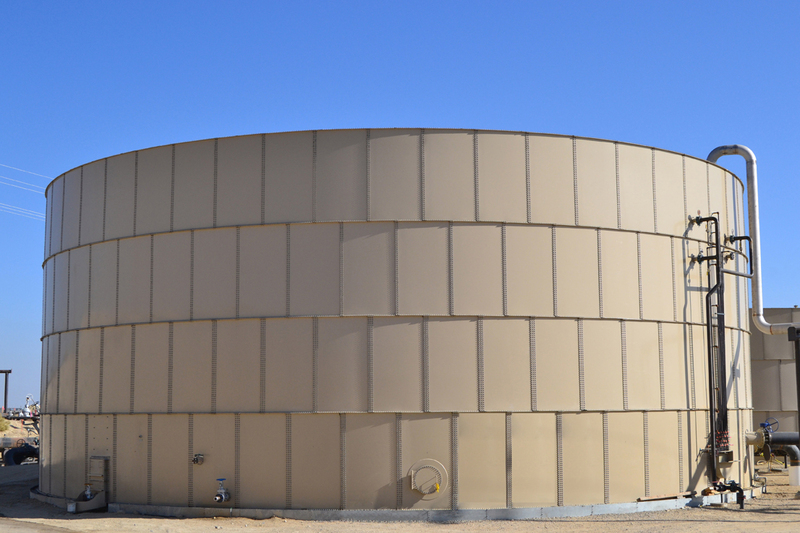 For example, the American Water Works Association (AWWA) D103 standard applies to all bolted tanks used for potable water storage and mandates the interior epoxy coating is NSF 61 certified. Bolted tanks for fire protection need to comply with the National Fire Protection Association (NFPA) 22 standards which requires specific tank components such as tank heating systems when needed and reinforced concrete ringwall foundation. When a bolted tank is used for oil storage, the American Petroleum Institute (API) 12B standard is commonly used as a reference but tanks do not have to comply. However, for customers desiring a guaranteed level of quality, the API 12B monogram program ensures the tank meets very specific design criteria and the bolted tank manufacturer is API Spec Q1 / ISO 9001:2008 certified. Over 33 YEARS of Building Bolted Steel Tanks! 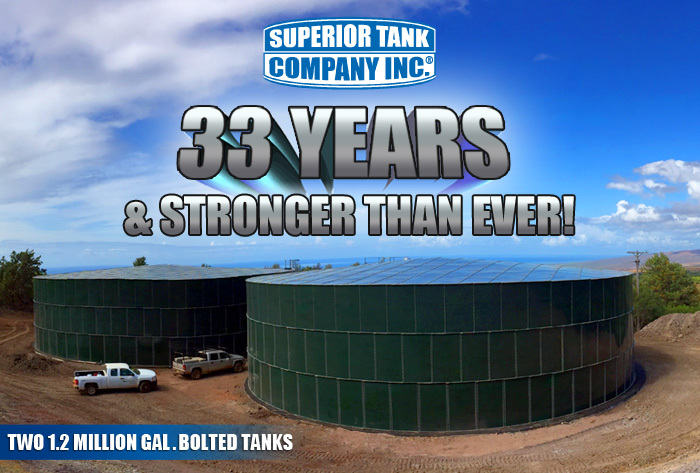 Superior Tank Co., Inc. (STCI) has been engineering, manufacturing and installing bolted steel tanks since 1984. Over the last 33 years, STCI has manufactured thousands of bolted tanks which have been successfully installed throughout the world. Our history has shown STCI has the strength and structure to last. 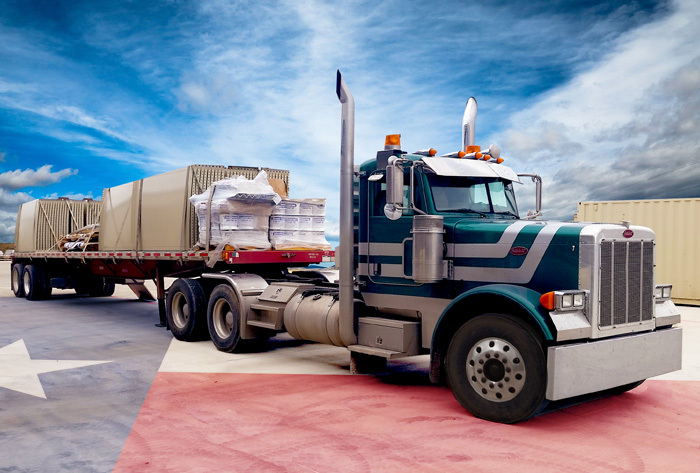 STCI is one of the few bolted tank manufacturers in the United States and the only company which is family owned and operated providing our customers with the confidence that they are purchasing from a company with the highest values and standards. 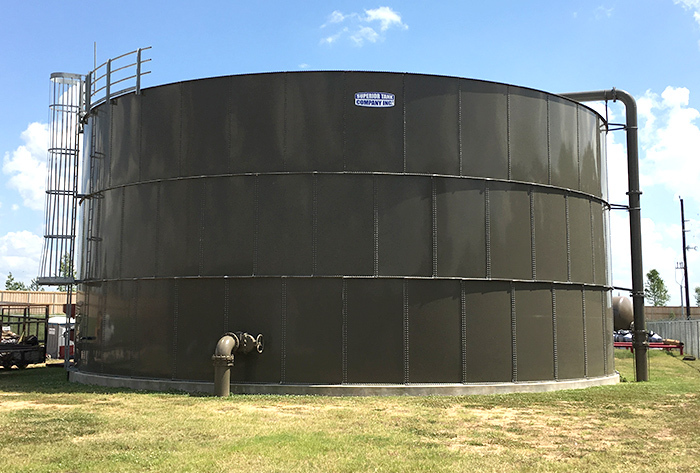 As we operate our own State-of-the-Art bolted tank manufacturing plant and welded steel tank fabrication facility, we have complete control of our quality and tank production schedule. Our bolted steel tank production facilities also include a powder coating line allowing us to offer various powder coating formulas including epoxy and TGIC polyester as well as specialized Scotchkote for extremely corrosive liquids. 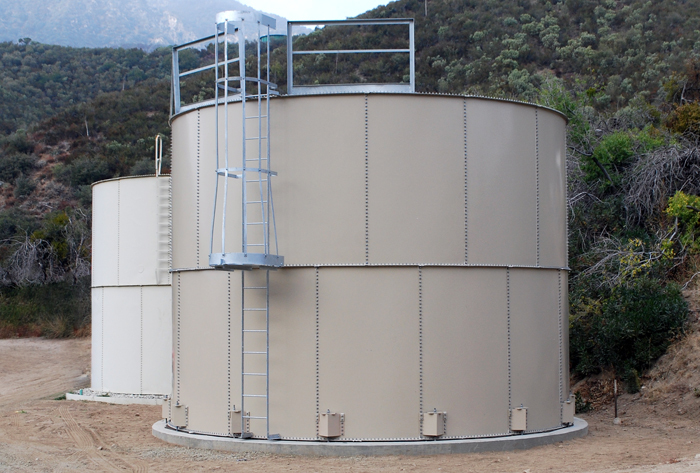 When purchasing a bolted steel tank or a welded steel water storage tank, one of the key criteria determining the design parameters of the tank is the Seismic Use Group (SUG) classification. The term Seismic Use Group is essentially the same as the terms Occupancy Category and Risk Category used by the International Building Code (IBC) and the American Society of Civil Engineers (ASCE). The Seismic Use Group classification is used to determine the magnitude of environmental loading applied to the bolted or welded tank structure. Despite the name, the Seismic Use Group classification is applicable to other environmental loads such as wind, snow, ice, and floods. The Seismic Use Group along with the seismic accelerations at the site help determine the Seismic Design Category of a structure. Seismic Design Category is a letter rating from A to F with F being the worst case. There are special detailing requirements depending on what Seismic Design Category a structure is in. For example, with steel water storage tanks, the seismic design category impacts how the anchor bolts are designed. Superior Tank Co., Inc. (STCI) is proud to have provided the new bolted steel tank for the Cauayan City Water District in Isabela Philippines. The bolted tank is the first of its kind in Northern Luzon and highlights the benefits of a bolted steel tank. 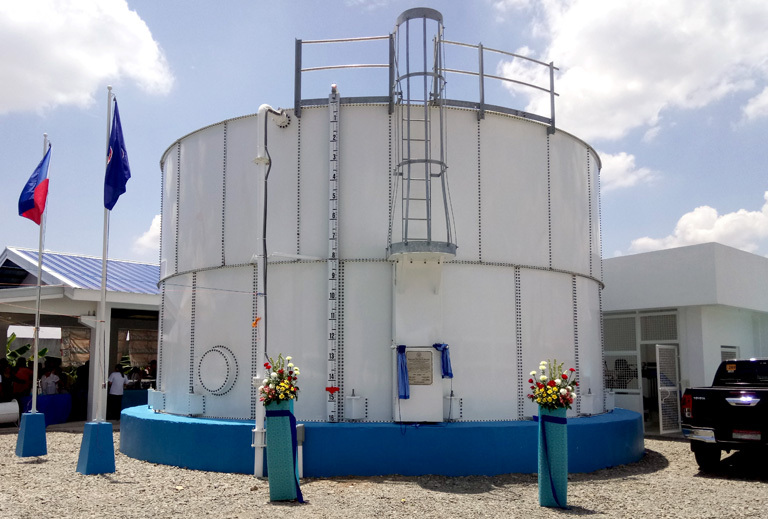 The epoxy coated tank provides storage of 79,000 gallons of potable water for Cauayan City and is dedicated to the late Governor Faustino N. Dy and his son Governor Benjamin G. Dy. Their vision and initiatives have resulted in the development and modernization of the Cauayan City Water District and also contributed to the City being branded as “Ideal City of The North”. The bolted steel tank used for the project was designed and manufactured to provide the city decades of service. Constructed of high strength carbon steel, the bolted tank is constructed for maximum durability and longevity. To meet local building codes and to withstand typhoons, the bolted tank is designed to meet a 200 mph wind load requirement. To accommodate the city’s future needs and save the city time and money, the bolted tank was designed to be easily expandable by simply adding rings to the tank. To survive the warm and humid conditions of the Philippines, the epoxy bolted tank features a corrosive resistant powder coating with an additional Silica-Zirconium(Si-Zr) underseal. To resist the harsh sun and UV rays, the exterior of the bolted tank was protected with specially formulated TGIC powder coating. Our Sky White color was selected to reduce the solar heat gain which helps to keep the water cooler and preserve water quality. In addition, bolted tanks manufactured by STCI are different than bolted tanks from other companies as it includes a steel floor. The steel floor ties the shell together and prevents leaks and water loss which can occur with concrete bottom tanks. The bolted steel tank in Cauayan City is truly an investment in the community and a testament to the vision of Governor Faustino N. Dy and Governor Benjamin G. Dy. Contact us to learn how we can help you plan for the future!